Sabeel Ahmed with the letter offering help to neighbors during Polar Vortex. Chicago-area resident Sabeel Ahmed says the offer — and invitation for chai and samosa — was also intended to help remove misunderstandings about immigrants and Muslims. As most of Midwest battled with the bitter cold snap that forced people to bundle up and stay in, an Indian American man thought the time was just right to send out warm greetings and an offer of help to all his neighbors. 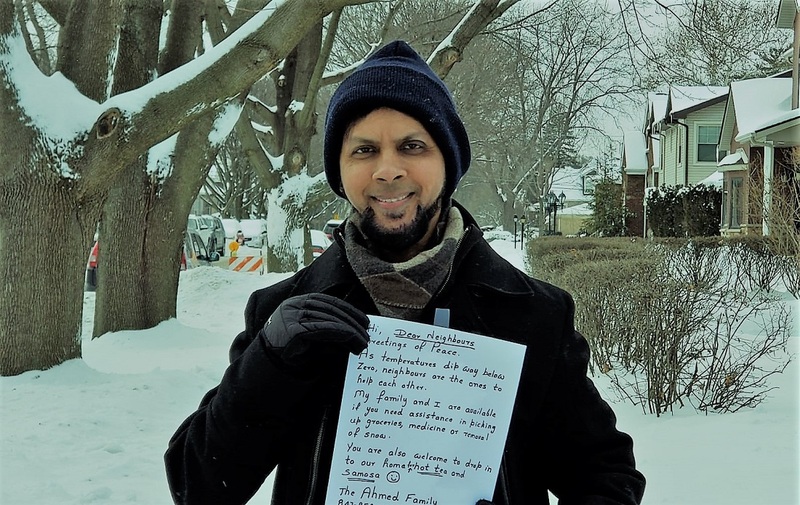 Sabeel Ahmed, a resident of Morton Grove, a northern suburb of Chicago, took this as a moment to extend his help and reach out to his neighbors who may be wary about immigrants and Muslims. Ahmed and his wife, Asma Naheed, delivered 40 hand-written notes during the frighteningly cold weather. The couple sent the notes to their neighbors, which said that they would be happy to offer help for any requirements such as picking up grocery, medications or even shoveling snow during the sub-zero temperatures that engulfed the Chicago area from Tuesday through Thursday. Ahmed, a doctor by profession, gave up his full-time job to practice community outreach some time ago. His daughter Zainab made a YouTube video of the family’s gesture, which has been very well-received. Ahmed and his wife were not only keen to drive and help their neighbors but also were hospitable enough to offer an invite for hot chai and samosas to all neighbors who may choose to come and chat with them during the cold snap.